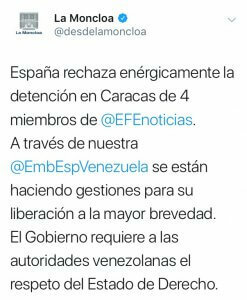 Spain has demanded the immediate release of journalists working for the Spanish news agency EFE who were arrested in Venezuela as part of a crackdown by Caracas on foreign media. 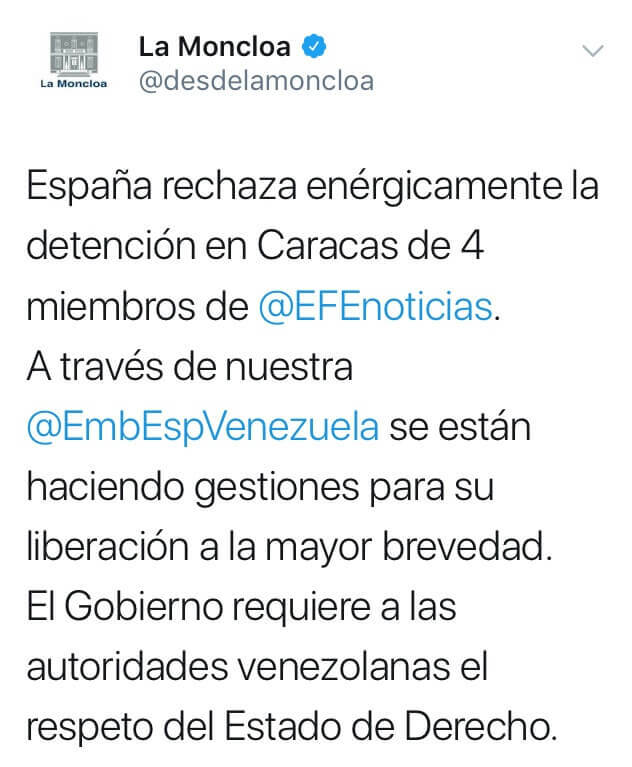 The Spanish government ‘strongly condemns’ the detention in Caracas of four members of a team from Spanish news agency EFE by Venezuela’s state intelligence agency Sebin, the foreign ministry said in a statement. ‘The government demands that the competent authorities release them immediately. The government again asks the Venezuelan authorities to respect the rule of law, human rights and fundamental freedoms, of which freedom of the press is a central element,’ it added. The three EFE journalists – a Spanish reporter, a Colombian videographer and a Colombian photographer — were arrested along with their Venezuelan driver on Wednesday, according to the Spanish news agency. Two French journalists from the TV channel TMC were detained on Tuesday as they filmed the presidential palace in Caracas and have not been heard from since, according to Venezuela’s main journalists’ union, the SNTP. Two Chilean journalists who were also arrested on Tuesday near the presidential palace were kicked out of Venezuela on Wednesday, the union added. The arrests come shortly after Venezuela’s opposition, which is challenging President Nicolas Maduro‘s legitimacy as the country’s leader, appealed for fresh street protests to demand a transition government and new elections. ‘They can not prevent the world from knowing what is happening in Venezuela,’ opposition leader Juan Guaido, who declared himself interim president last week, wrote on Twitter.